It now takes an entire ecosystem to build a chip—and lots of expensive tools. As design complexity grows, so does the need for every piece in the design flow—hardware, software, IP, as well as the ecosystem — to be tied together more closely. 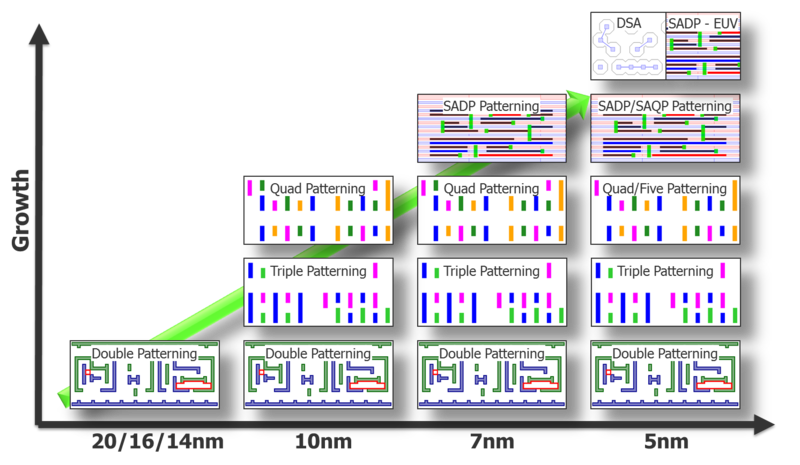 At one level, design flow capacity is simply getting bigger to accommodate massive finFET-class designs. But beyond sheer size, there are new interactions in the design flow that place much more emphasis on collaboration than in the past because it is viewed as the best way to realize efficiencies and optimize designs. eSilicon also used this technology to create a memory synthesis capability. “Logic synthesis is widely used to re-target logic as needed for an optimal result, but memories are usually pre-designed and static throughout the design process. Since half or more of advanced designs are occupied by memories, this approach doesn’t work very well. Using our knowledge base and optimization technology, we can build parameterized, virtual memory models for embedded memories that can be modified throughout the design process to achieve the best result,” he explained. Multi-patterning is impacting the design flow, as well. As a result, place-and-route and physical verification tools need to be color aware at 16/14nm and beyond, which adds to complexity. And timing closure now includes multi-parasitic corners that have been introduced by multi-patterning. Complexity is creating issues everywhere. IP selection has shifted from a simple process based on performance, power and cost, to an iterative one involving selection, configuration, integration and verification. Different parts of the design flow are changing due to the need to greatly increase efficiency across what has become a highly iterative design flow from IP selection, configuration, “The tight linkage across these aspects of the design flow is tooling, but it all starts with the right IP,” said Simon Rance, senior product manager, Systems and Software Group at Arm. • For IP selection, tools are being introduced to help architects and designers with the exploration and selection of highly configurable IP. Architects and designers need to select the right set of interoperable IP that also works well with tools across the design flow for configuration, integration, verification and implementation. • For configuration, designers are leveraging tooling with embedded algorithms to manage the complexities of highly configurable IP. Configuration is no longer just IP-specific because many IPs are configurable based on their surrounding system context. The number of configuration options across IP are growing into the hundreds. Managing this at an RTL level is very difficult and error-prone, if not impossible. • For integration, tools are being leveraged by system designers to integrate and assemble the system as quickly as possible so that verification can start sooner. Integration tools are being enhanced continually to utilize more IP and system design meta-data to drive the automation of system assembly. • For verification, tools are now leveraging the same meta-data and are being enhanced to tightly link with the configuration and integration tools. This tight linkage is key in reducing the number of iterations and getting to design closure as quickly as possible. In addition to clearer and better communication between ecosystem partners, better access to information between tools in a flow is also coalescing today. If simulation and emulation are combined into what is referred to as verification acceleration (or simulation acceleration) where the testbench is run in the simulator, and the DUT is in the emulator, speedups can range between 10X and 100X. “It’s not like the 1 millionX or the 10,000X, which can be achieved [if the entire design is contained] in the emulation box due to the communication between the host and the hardware but still, there’s very exciting stuff happening there to bring these together and tightly integrate them including things like hot swap,” Schirrmeister said, noting that a common compile between the two makes this possible. Ties between emulation and FPGA prototyping are viewed as the next big breakthrough, and FPGA projects are an indication of how design and verification flows are changing. The changes aren’t limited to development and verification tools and methodologies, either. The certification of safety-critical applications based on SoC devices is another challenge. “In the past it was relatively easy to determine if that’s a software or hardware certification requirement, but now a project may require both or new specifications created by certification authorities. A good example is the DO-254 specification, which covers hardware requirements, while DO-178 specification refers to software. If we use an FPGA with an embedded processor we will need to pass both certifications, which is an extremely time-consuming and expensive process due to the lack of regulations for modern SoC projects,” Zalewski said. But consolidating coverage models between the techniques as well as a database remains a largely unsolved problem, even though end users demand it. Software programmers have always been able to rely on the next release, something that often isn’t possible in hardware. As a result, an entire verification methodology was built, along with a management methodology, release processes, sign-off and many other automation tools. This is because at $10 million for a chip spin, or now $50 million, it was too expensive not to do that. But now with so many electronic products being defined by the software, the software side has been forced to develop new ways of working, Davidmann said. To this point, what’s happened is that the software world has worked very hard to make a process to the philosophical and methodology of designing software; as well as the tools, and technologies, and optimization. But getting engineers to adopt new approaches, technologies, and methodologies isn’t always so simple. Understanding and implementing power state switching delays can make or break a design.